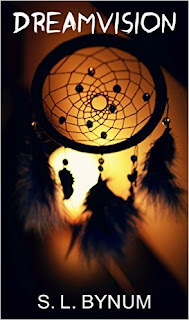 DREAMVISION is filled with horror and suspense at every turn, and is told in the form of a blog from Abigail’s perspective during the year 2007. Warm wind rushed past me as I ran to the end of our street and across another street. Trixie’s house was about a mile from mine. I was athletic, so the distance was barely a problem for me. When I reached Trixie’s gray, one-story, ancient house, I rang the doorbell three times. Then I stood and waited, trying to catch my breath. My heart was hammering against my chest, as though it wanted to burst out of it. I had a bad feeling for some reason. Trixie opened the door, to my great relief. “Abby? What are you doing here?” she asked. “I need…to tell you…something,” I panted. “Yes. Is…your mom home?” I didn’t want anyone around when I told Trixie what I learned. Trixie didn’t have any siblings, or a dad. Her dad had run off before she’d been born. “She is?! ?” I pushed past Trixie into the house. “Hey–! Abby!” Trixie protested, but I didn’t pay attention to her. I ran down the hallway to the first bathroom, the one next to Trixie’s room. It was empty. I continued on to Mrs. Vander’s bedroom, and the bathroom door in there was closed. I heard music playing inside, and Mrs. Vander was singing along with it. I lightly knocked on the door. I didn’t want to seem too urgent. But what excuse would I give her? “Just do it. She’s the one I dreamt about!” I had a terrible feeling in my gut. Before she could come up with an excuse, there was a tremendous crash behind Mrs. Vander. A gasp escaped from my throat, and Trixie let out a scream. We all turned to look, just in time to see the boombox splash into the tub of water, sending a wave of it onto the floor. Sparks shot up into the air, and smoke furled up from the water. The boombox let out one last garbled cry of “…ooo…ve…errrrrr…” and died out. S. L. Bynum fell in love with writing at the age of twelve, when she wrote a rendition of The Three Little Pigs for her little brother’s homework assignment. Her dream has been to be an author since she was sixteen, and she now has two books out, Grim Crush and Dreamvision. Besides books, she loves desserts, fashion, dancing (when she’s alone), warm weather, and playing video games. She lives in Greensboro, North Carolina with her family.